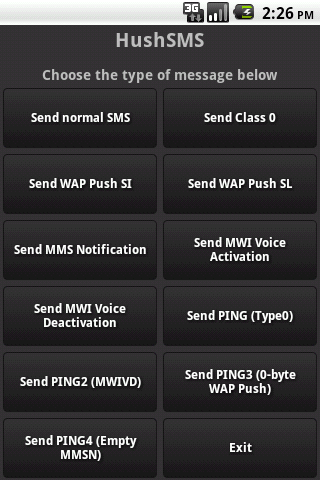 HushSMS is an application to send specific types of short messages in GSM Networks (CDMA is not supported). It can be useful during a pentest or ethical hacking. 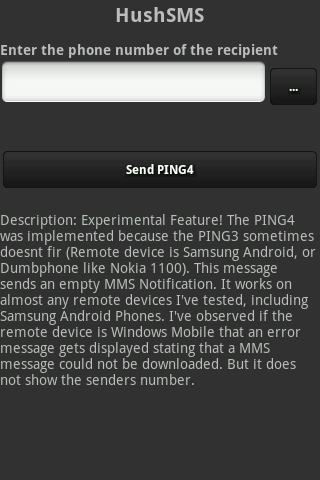 All AT&T users: You carrier will not allow sending Ping messages. These messages will be transformed into regulator SMS. HushSMS relies on the Xposed Framework and is thus also compatible with Android 5.0.x Lollipop. There are reports of malfunctions on Android Lollipop 5.1 due to Xposed instabilities. Attention: As of version 2.7 a separate Xposed Helper MODULE (the Xposed Framework ist still required) is no longer needed. It is integrated now directly into HushSMS. Please make sure you disable/uninstall the old XposedHelperModule for HushSMS before using version 2.7 (or above)!!! Android 4.4 (KitKat) Users: Due to KitKat storing ANY outgoing SMS in your inbox it will also store a message with the term “allyoumessagesarebelongtous”. This is due to the changed SMS API int Android 4.4. I will try to find a workaround for this. ***Note: It has come to my attention that some AV vendors (namely Avast for Android) give a false positive on claiming that HushSMS contains malware. This is definitely not the case. SilentServices is a legal company and we do not develop malware. HushSMS is an app with a long history going back to 2006. I have already tried to contact Avast on this issue but unfortunately to no avail. The only reason I could imagine is that HushSMS has been cracked a dozend times in the past and as usual with cracked android apps it has been tampered with and I also have evidence that crackers have put malware in the cracked releases. Maybe Avast detected such a tampered version and thus declare HushSMS as malware in general. You can purchase HushSMS directly with PayPal for 5.49€. Just click the button. Q: I bought HushSMS via Play Store while it was available. How do I get updates now that Google removed it? Q: How will you provide updates in the future? A: Currently there is no update mechanism in HushSMS. Plans are to provide you with the possibility to let HushSMS automatically, or optional manually check for updates. Q: If I buy it via PayPal, how can I redownload it later again in case I lose the APK? Q: Something went wrong. I payed with PayPal but did not get redirected to the download link. What can I do? A: Send me an email from from your PayPal registered email address and I will send you the APK. HushSMS will run on any android device form v2.2 up, but if a specific API method is missing in your ROM some functions are not displayed on your device . You can try the Xposed Module in that case. HTC devices with official ROM and SenseUI should be fully supported. 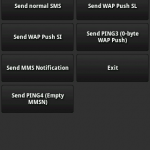 HushSMS is a GSM ONLY app and will not work in CDMA networks! Thanks to XDA Dev Member androcheck! Now every device with Xposed Framework can enable the HushSMS Module in Xposed and should be able to send all message types, including class0 and silent ping! For usage and installation instructions please follow this link. If you find any bugs please report them to me so I can make the software even better. – Due to API change in Android 4.4 an additional message is locally stored with the term “allyourmessagesarebelongtous”. 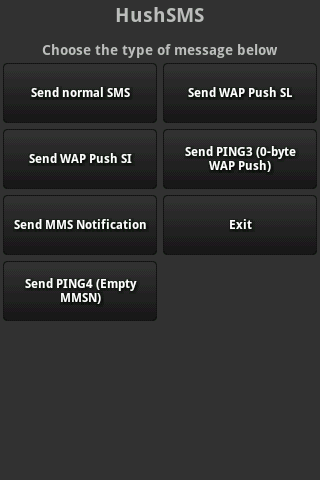 HushSMS for Android is a software to send specific SMS types that are normaly not available to users. Q: Why such a software? A: I regulary need it in my job. Sometimes I have to be sure a specific phone is switched on and I can send information to that phone without it beeing stored (class zero message). There is currently no message concatenation implemented. This limits the messages in size as described below. You “should” get a “Message Sent Notification” as well as a “Message Delivered Notification” for every message type. 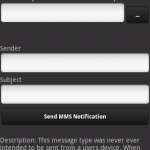 HushSMS is designed to leave no traces on the senders device. Messages are not stored, no statistics are created, etc. Please keep in mind: Even if some messages allow obfuscating the senders ID on some targeted devices, there is no guarantee that the recipient will not find out who sent him messages. In addition some messages might not work on some providers as they are able to block or transform messages. I have received good results in all german carriers but cannot speak for results with carriers in other countries. HushSMS relies mainly on a library google decided to remove since Eclair (Android 2.0). However, HTC was so kind to reintegrate tis library for it’s Sense UI. Thus HTC devices should be fully supported (at least the ones I own work without problems). As for other devices only a limited functionality is given. See below. If you want all features and are using a custom ROM you might want to ask the ROM creator for reimplementing the sendRawPdu feature. HushSMS automatically checks for this function on startup, and if detected it will enable all features. HushSMS does not and will never under no circumstances transmit data in what ever form back to the author. There is of course communication with the goolge market due to the implemented licensing. This is a standard SMS. The message size is limited to 160 characters. A message that should per standard be immediately display to the user in a pop-up window. On some phones (like iPhone afaik) the message gets display without the senders ID and without the possibility to save the message. The message size is limited to 160 characters. SI stands for Service Indication. This type of message was designed for service providers to inform their customers of credit limits for their prepaid cards, software updates etc. On some devices (Windows Mobile, old Blackberrys) this message gets display with the number from the providers sms service center. Some Android devices are capable of receiving such messages, others aren’t. Afaik iPhones are not capable of receiving services messages (they simply drop them). The message size for sender, subject and message is currently limited to 40 characters each. – WAP Push SL SL stands for Service Load. This type of message was designed for service providers to push content to their customers devices. Different subtypes allowed user interaction, other allowed NO userinteraction, means that the ressource defined in the message should be loaded and executed without user notification or interaction. The last type is what is implemented in HushSMS. This only works on Windows Mobile targets afaik. But also on some devices the sender is obfuscated. The message size is currently limited to 40 characters. This message type was never ever intended to be sent from a users device. 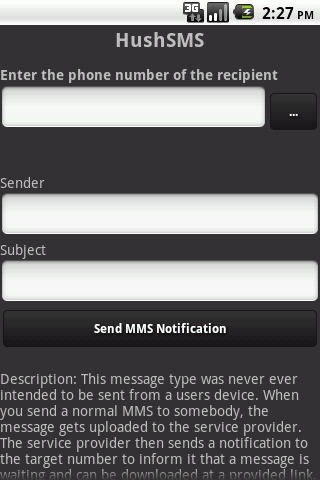 When you send a normal MMS to somebody, the message gets uploaded to the service provider. The service provider then sends a notification to the target number to inform it that a message is waiting and can be downloaded at a provided link. The receipients device will then establish a data connection to the service provider and download the message content. HushSMS is capable of sending such a notification on behalf of a service provider. Unfortunately the provided content link cannot be accessed from the target devices due to their MMS configuration (you know..proxies, APN and such stuff). However, with this type of message you can obfuscate the sender and subject. The message size for sender and subject is currently limited to 30 characters each. Now this is the fun stuff. With this message you can let the target device think that there is a voice message on the receipients voice mal box. An icon gets displayed and the receipient usually will call his voice box finding out that there are no new messages. BUT: The symbol will not disapear. It will stay there until the user a) gets a deactivation message or b) reflashes his smartphone. Yes, even rebooting does not help. Be aware that you can drive people nuts with that one. This is the opposite to the activation message. It will remove the icon from the receipients display. These MWI messages have nowadays no function on devices with Android or iOS. However they should display fine on older Phones like Nokia E7 and such. You may already have heard of this kind of messages. Officials (like feds or other agencies) use this kind of message in conjunction with the service provider to locate you (or your device). HushSMS uses it in another manner, since we don’t have access to the provider network. 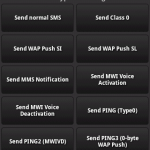 HushSMS uses this message to determine if the receipients device is currently booked into the network and as such the receipient should be available or not. As per standard this message muste be received and acknowledged by any cell phone without notifying the receipient. Thus this message is also call “silent sms”. I have heard (but never personally seen) that some providers transform this message automatically to an empty default message. Thus, if this is true, the senders number is shown, but no one will guess why an empty message was sent. 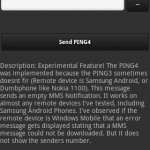 The Ping 2 was developed for users who had bad results with the original ping message. It is nothing else that a MWI Voice DeActivation message with a requestes delivery report. Remember: Whatever YOU do with HushSMS, I might not, under no circumstances be held responsible.